You may not have been paying much attention, but that little rumble you heard late last summer was more of a grumble coming from Blue Valley Southwest High School. Or, maybe - probably? - it was a loud shout of joy coming from Kansas City area rival St. Thomas Aquinas. Nationally-ranked hurdle standout Noah Green (pictured at right) switched schools this past year, leaving Blue Valley Southwest and joining the defending 5A state champion Saints. It was a fortunate move for St. Thomas Aquinas, and one that gives a huge boost to their bid to repeat as state champs. 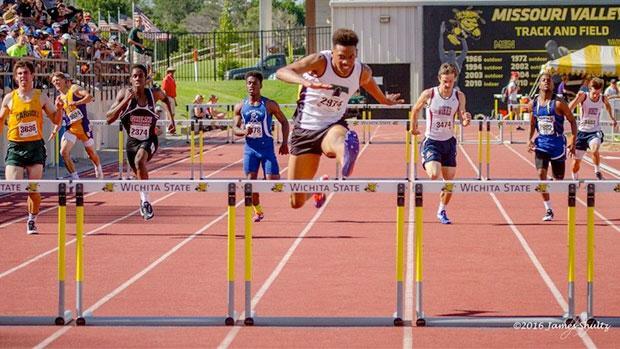 Green, a junior, was the Kansas 5A champion in the 110 meter hurdles and the 300 meter hurdles last year for Blue Valley Southwest. He placed fifth in the long jump, accounting for 24 points at the state meet. During the recent indoor season, he clocked 48.84 in the 400 meters, which puts him among the best in the state already in that event. It's a stretch to say Green could pull off those four events at the state meet, but even if he competes in three and with Aquinas' dominance in the distance events, the Saints are undoubtedly the team favorite heading into the 2017 season. Aquinas seniors Will Cole and Alex Gill finished 1-2 in the state cross country championships, and they are the odds-on favorites to do that in the 3200, and possibly also in the 1600. Cole is the defending state champ in the 3200, and Gill should also score state points in the 800. Aquinas is typically the team to watch in the 4 X 800 relay, as well. Even so, Class 5A boys is a division loaded with teams that have key, experienced returners capable of knocking off St. Thomas Aquinas. Liberal may have the best chance of doing just that. The Redskins are led by senior Austin Mullins, the defending state champion in the 400 who is also a top three contender in the 110 hurdles and 300 hurdles. Junior teammate Dusty Torres has the state's top preseason time in the 200, and is also a top three contender in the 100 and 400. Newton has good depth in the field events and on the track. Look for them to score points with seniors Kade Remsberg (100 and 200), Kelby Lawrence (110 hurdles and 300 hurdles), and Aiden Mills (shot put and discus). Shawnee Heights, the 2015 state champs, is still strong. They have a pair of returning state champions in juniors Hunter Henderson (1600) and Michael Hoffer (high jump), but the Thunderbirds should also score big points with Hoffer (long jump and triple jump); junior Cade Holmes (discus and shot put) and seniors Colton Oshel and Wyatt Hubert (javelin). Perennial contenders Leavenworth and Blue Valley Southwest have taken a hit to their depth, but they are still very strong and can't be overlooked. Leavenworth senior Arik Parker is a force in the shot put and discus, and sprinters Anthony Gould, a sophomore, and Clifford Robinson, a senior, likely will score well in the 100 and 200. Blue Valley Southwest senior Konrad Marshall has the top time in the 100 entering the season, and is a top 3 contender in the 200, while distance runners Andrew Lawrence, a sophomore, and junior Dylan Miller will pick up points in those events, as well. The other returning state champion in Class 5A boys is senior Connar Southard of Pittsburg (800). If you feel the need for speed, the Class 5A girls state meet will satisfy that desire. All eight finalists in last year's 200 meter dash - and 7 of 8 in the 100 - return for the 2017 season. Defending champion Newton brings back an all-star cast of sprinters that has firmly placed the squad as preseason favorites for the state title. Sophomore Kalli Anderson, junior Savannah Simmons and senior Jen Andres are all top five contenders in the 100 and 200 meter dashes. Junior Taylor Antonowich is one of the division's best in the 400. And, Newton smoked the field in the 4 X 100 and 4 X 400 relays last year. That star power alone could be worth as much as 60 points or more at the state meet. But Newton also has strength in the field events, with seniors Kailey Harris (triple jump and long jump), Nicole Engelken (javelin), Brooke Lachenmayer (shot put) and Katie Reed (discus). Mill Valley, Pittsburg, Valley Center and Emporia may have the best chance to dethrone Newton this year. Mill Valley senior Megan Eckman is the defending state champion in the high jump. The Jaguars also have a powerful distance duo in sophomore Delaney Kemp and junior Britton Nelson; and standout throwers in seniors Gabby Hopkins (shot put and discus) and Morgan Thomas (javelin). Thomas is also a standout high jumper and a medal contender in the triple jump. Pittsburg senior Taylor Muff is the defending state champion in the 100 hurdles and 300 hurdles, as well as one of the division's best in the discus. Juniors McKenzie Wilks and Abbie Casper are top five contenders in the 800 meter run, and senior Daeshia Turner could win the triple jump. Valley Center's big points should come from senior Taylor Latimer in the discus (where she is the defending state champ), shot put and javelin. Emporia's chances hinge on the field events with seniors Jennica Smith (javelin), Mikayla Simons (shot put), Kelsey Gordon (triple jump); juniors Olivia Young (high jump) and Devan Crow (pole vault); and sophomore Beth Schwerdtfeger (long jump). Junior Linnea Meier and sophomore Alexis Davies are also top 5 contenders in the 400. Leavenworth junior Aarika Lister is the defending state champion in the 100 and 200 meter dashes. She was the only female sprinter to run under 12 seconds for the 100 meters at last year's state meet. The other returning state champion this year is Goddard senior pole vaulter Hannah Buller.